Having recently returned from a few weeks in sunny Portugal, to escape the UK winter blues, I met several retired people who were staying long term over winter, from November to March for example. I found that idea attractive, but would find staying in one warm spot in Europe for months on end pretty boring, to be honest. 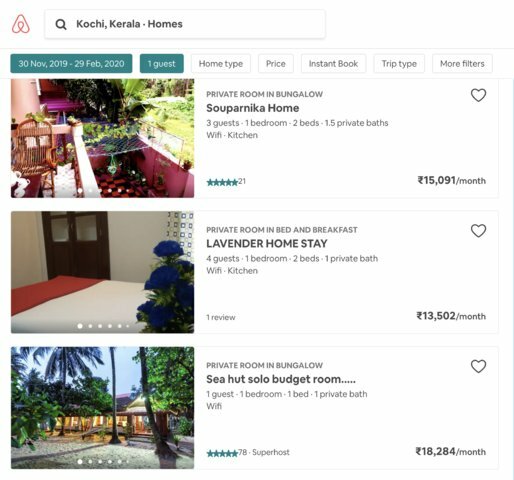 I guess overseas folk stay for many months in Goa, in cheap beach shacks, etc, but I wonder if there is now much of an option to rent an apartment in a larger city In India for several months at a time, some sort of air bnb type thing? I have enjoyed my travels around India, but am now slowing down, wondering about a seasonal mini marigold hotel for one person, where I can do my own cooking. Depends on your budget and what you are looking for . Not sure if you have been to Kochi/Cochin but the weather is quite nice there during winter in the UK. Well connected from the UK ( if you are happy to travel via the middle east on Emirates/Etihad or Qatar ) . Decent infrastructure with the Metro now working well. Rental prices are cheaper than most of the other metros on the south. Quite good healthcare backup in case of any medical issues..
My suggestion is to go for homestay in the first instance and then you can decide on what to do next.. I have been to Cochin, but just a short visit in 1983. Broadly speaking, I want somewhere warm that I can feel that I am living my "day to day life", rather than "on holiday" in a very tourist orientated destination. Hence not too sure about Goa, etc. Thanks for the Cochin area suggestion, and the homestay idea. You are talking about the nicest months to be in Southern India! The months, centring on December/January, that many, including a lot of people born and bred here, consider to have an actually-bearable climate! November might be wet. I don't know about costs re air'b'n'b would be. I think they operate here. As you know, once settled, the cost of living, rather than the cost of travelling, is lower than England. I think I had the South in the back of my mind, I believe that Delhi, for example can get quite chilly at night in winter, as well as their fog issues. 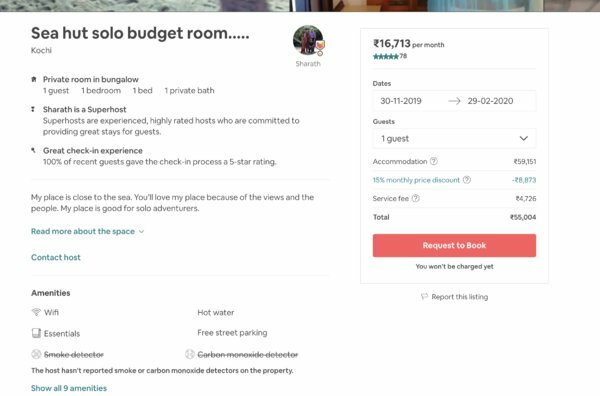 I have never used air bnb, so not quite sure whether they offer self contained apartments for longer term, or just a room in the owners home for a short stay, rather like homestay? Very early days, just back from Portugal yesterday, but along with the new e-visa, it has started me thinking...! Both and Delhi in the winter is aargh especially if you show up in chappels. i stole a heater from an old flame.. It is a good idea. And i did a quick search on Air bnb. Plenty of options available. Here is a sample result. My guess is that you can get these a lot cheaper if you go via a local friend or agent. Typically Air bnb rooms are let out on short durations (less than a week) and hence prices are calculated accordingly. While some discounts are given for long term stays, as mentioned in one appended here, these discounts can be higher, in my opinion. I am sure you would find something to your taste, budget and location. Apart from Air bnb, there are many sites that offer such services, but i like Air bnb since both the lessor and the lessee are rated by each other. We used Air bnb at Hawaii and at Athens and the experience was good. We used Booking.com at Rome and the experience was wanting. Having a base and making short trips is a very good idea since nowadays i am loath to pack/unpack every other day. I do not travel light ( anyway, that's relative) and that adds to my discomfort. Explore the possibilities. Half the fun, is in the planning. Thanks Earthian, I appreciate you taking the time to check out air bnb options. The prices and options seem fairly reasonable indeed. How is Kolkata for longer stays in the "winter" months, similarly cold? In areas like Cochin, Varkala and Trivandrum it's common to find Europeans who come for the whole season. But I'd strongly suggest not booking anyplace beforehand for a long stay. See what area you like then look around for a long-term place. March is actually very lovely and like the the comment on London..
Kolkata can be very cold in winters, especially if their is a cold wave. I discovered that to my peril almost a decade back. It was very chilly in the evenings and mornings. Daytime was manageable. However we have folks here who experience winters there every year - so do listen to what they may have to say. Do you have any tips on how to find longer seasonal stays on arrival? I understand just walking around inspecting hotel rooms, etc, before choosing, but can one find an apartment with cooking facilities in this way too? Part of the "non tourist" thing is also that I assume us foreigners will be paying a premium, because things in those areas are set up to appeal to foreigners?